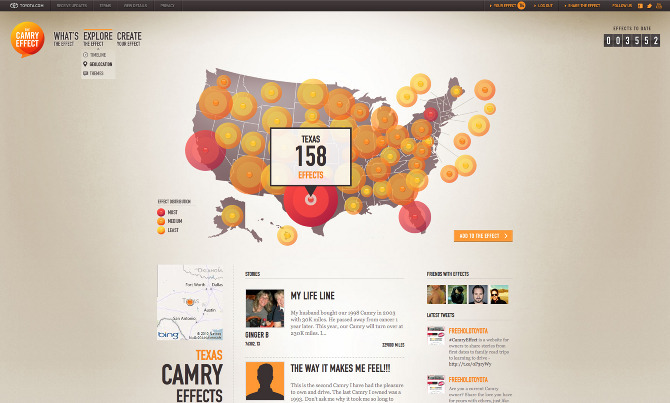 Toyota wanted a social campaign to coincide with the launch of the 2012 Camry, the best-selling car in America. We collected demographic information and analyzed existing behaviors. We noticed that Camry owners were already telling their stories online through forums, Facebook posts, etc. People love the Camrys and because they last so long, they are frequently passed from one generation to another. People were already telling their stories online, but it was scattered through the diaspora of the Internet and none of it was SEO. We had the chance to collect and amplify existing behavior. In addition, the place of high touch interaction (servicing at dealerships) was untapped and regarded as a chore for owners. 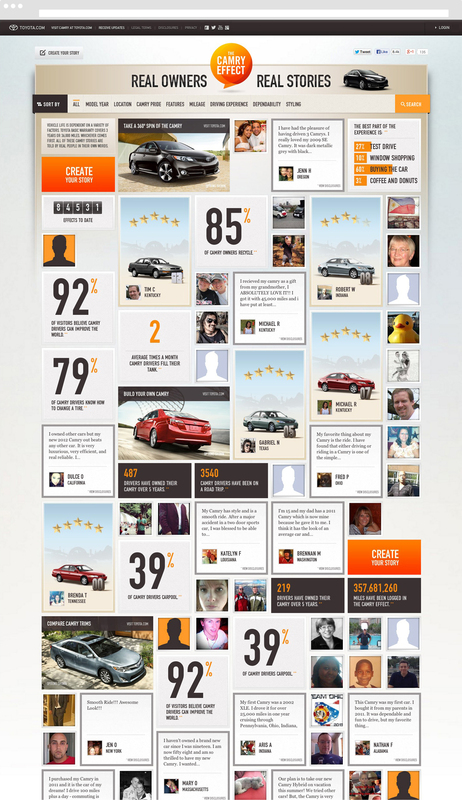 On top of which, the dealerships had never been engaged or coordinated in social marketing. 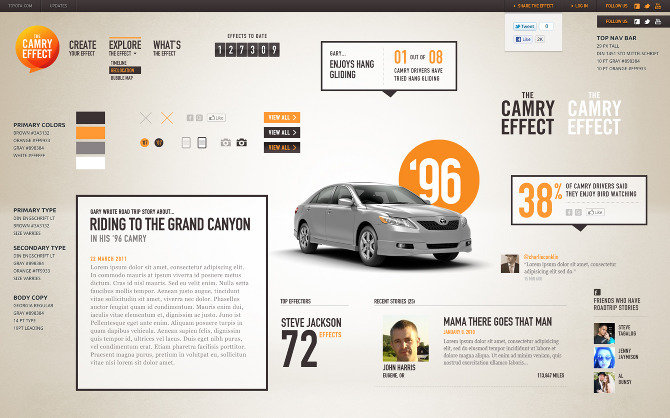 I proposed creating a central site with tools for people to tell, visualize, and share their Camry stories. 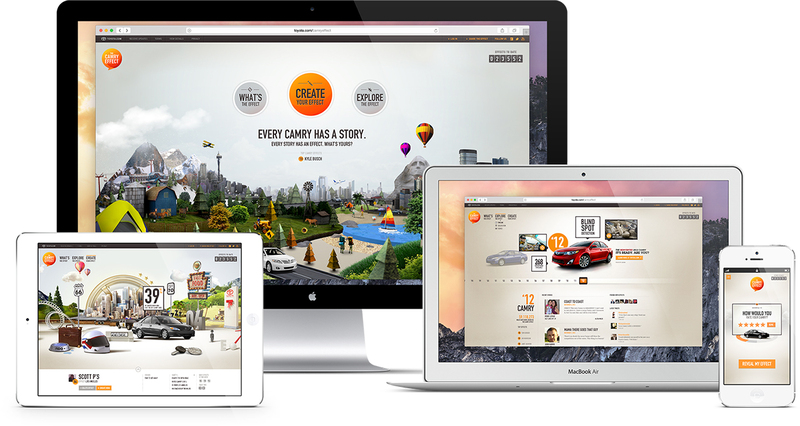 Users would see their stories brought to life. In addition, the dealerships would be actively engaged to collect stories as a way of reminding customers of the wonderful times they'd experienced with their cars. When perspective buyers search for testimonials or recommendations, the SEO'd Camry Effect stories dominate the results. I led the team that developed the concept and designs and development plan. After seeling the client on the idea, I then had to sell the idea to ~150 partner organizations and the dealership organization. Everyone saw the opportunity and excitedly agreed. In other words, it moved the needle. The project has been so successful, the client said, We were expecting a 6 out of 10 and you gave us an 11. In fact, it was so successful, Toyota decided to back it with a Super Bowl ad.